The dog and I have colds. Interesting that the two of us were the most passive members of our family this weekend. The husband and the 7th grader performed “Once on This Island” three times. He played music, she sang, danced, and acted. The 11th grader danced in two dance recitals in a row on Sunday. I watched most of these things. Milo the dog stayed home, where I presume he lay on his side, probably mostly in the powder room. And now we are the ones with sniffles. Speaking of complaining, I realize that this is the time of year I complain about the yard work. Currently, the grass is as high as an elephant’s eye and I’m just fine about it. The husband has had no time to mow, and I refuse to do it. My excuse is that I’m allergic to grass. This is actually true. Also, I don’t want to mow. Furthermore, as I may have mentioned, I’m allergic to bees, which provides a further excuse for avoiding weeding. All of this renders me more comfortable putting in forty-five minutes here and there, pulling things out of the ground while listening to Fresh Air with Terry Gross or Lexicon Valley on my iPhone. Whenever I sense the rising level of overwhelm - I really hate that word, but it does fit here - I remind myself of the above-mentioned life-raft of excuses. Plus, I just don’t care that much anymore. I’m guessing this attitude adjustment is overall positive. Viewed one way, perhaps it’s indicating a slide into total slovenliness. Viewed another way, it’s a sign that I’m becoming more comfortable in my home and I’m not so worried about the Joneses anymore. That’s the way I choose to see it, Readers. Although our bedroom shades might tip those scales in the slovenly direction. Have I mentioned our bedroom shades? Our ugly bedroom shades? The shades that, when we first moved into the house, filled me with core-shaking rage every time I had to open them? I must have mentioned the shades. This, by the way, is a fine example of displacement. Yes, the shades were ugly, and yes, I wanted to replace them. But the real problem was how angry I was about our move and that we couldn’t afford to replace them because we had more pressing expenses. I displaced my anger at my situation onto the shades. Also onto the husband, from time to time, but that's another story. Well, the other day, as I opened our ugly slatted shades in our bedroom, I noticed that I had become more relaxed about those, too. Last year I almost replaced them. I went so far as to take advantage of the consultation service at Calico Corners. We had almost made our final decision on a nice fabric roman shade. Then the consultant quit and we were left to ourselves. Without the push of a salesperson, I sunk back into nothingness. And now the shades are still there, still ugly, still insufficient. But they don’t fill me with rage anymore. But the garden. Well, we hired someone to help us do a little landscaping that will eventually result in more ground cover and fewer mulched beds that need weeding. This awesome landscaper who feels like a friend moved a bunch of stuff from the back yard to front yard, and a bunch of stuff from the front yard to the back. We also have a plan that will unfold over a few years. So overall, we are working on the yard, even when we are not actually, uh, working on the yard. Landscaper added Pieris japonica by the front door. So what is the lesson here? A little money is a rage emollient? Oh, dear, that’s not a lesson I want to teach. How about acceptance? Yes, that’s a better lesson. I’ve accepted that I’m not going to race to have the best looking yard unless I really love gardening. Also, patience. I can wait for things. That’s good, right? Why am I asking you if it’s good to be able to wait? I know it’s good! Didn’t I just finish reading a whole book about how learning to wait is good? In case you weren’t paying attention, I’m referring to Walter Mischel’s The Marshmallow Test. I talk about it here and here. The shades. I’m not that concerned about the shades, although eventually I would like different ones. 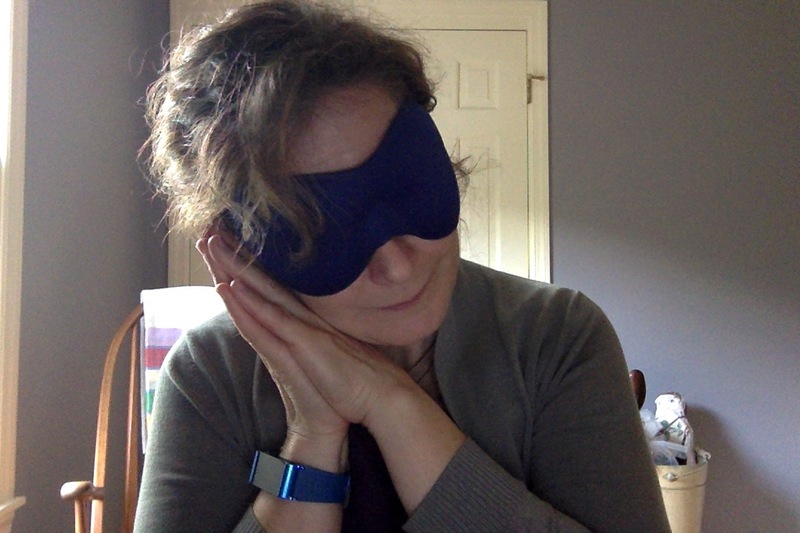 In the meantime, I wear a sleep mask. Yes, really. And I feel just like Auntie Mame.